Although I shared a short part of this on Wednesday in the weekly roundup, I wanted to share the whole thing with you. Bill Watterson is the individual who wrote and drew the comic strip Calvin and Hobbes in the 1980s and 1990s. The text is from a graduation speech he gave, while the art is actually drawn by Gavin Aung Than emulating Watterson’s style. My hard work opens doors for my children. If you don’t want to see something, you can convince yourself not to see it. The first one is the most dangerous one. You can’t keep doing the same thing and expect different results. If you want different results, you have to change something about what you’re doing. 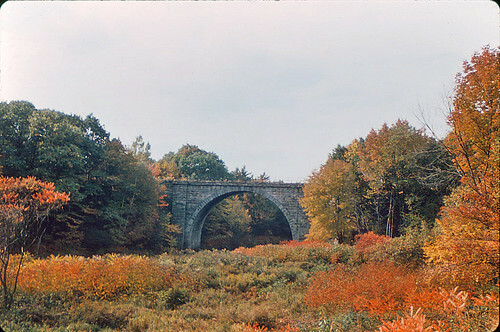 This viaduct in Keene, New Hampshire, surrounded by the autumn colors, is just gorgeous. The architecture looks ancient but is still very functional, and the trees around it set it off wonderfully. This is my current desktop wallpaper. Thanks to the Keene and Cheshire County Historical Society for the image. The path to anything great is a bumpy one. The rush to great prices can trample some. It’s stories like these – about lives of potential cut short before they bloom – that really tug at me.